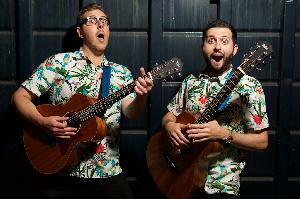 Jason Blackman and Jason Bader are best friends from childhood who perform as a Hawaiian shirt-clad musical comedy duo called, “The Jasons.” They’ve performed all over LA including The Comedy Store, The Improv, The Comedy Central Stage & UCB with acts like Ray Romano, Marc Maron and Craig Shoemaker. Their influences include Tenacious D, Flight of The Concords & The Smothers Brothers. They’re very silly.